Most marketers know that having a documented content marketing strategy and understanding one’s audience are vital for success. 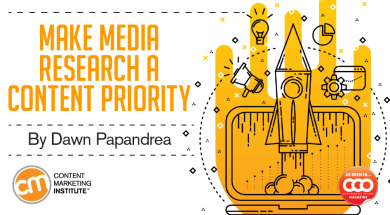 Where you may fall short, however, is by under-investing in media research — the type of research that will help uncover how you will distribute and promote your content before you create it. That comes from Chad Pollitt, vice president of audience and co-founder of Relevance, and author of The Content Promotion Manifesto. “Research will not only tell you who you’re writing for, it will also uncover how you’re going to promote your content from an earned and paid perspective,” he says. In other words, the days of “if you build it, they will come,” are over, says Pollitt. Today’s content marketers must connect with audiences on their turf. Pollitt says the notion that good content can single-handedly grow an audience was true when content marketing was a novel concept. “But the era of content deficits is over,” he says. To stand out in our content-saturated world, digital marketers must leverage earned and paid media, says Pollitt. “We have to do native advertising and media outreach, and place bylines on other websites to tap into other audiences. When there’s a content surplus, not doing rigorous media research before you create content is a recipe for disaster,” he says. Delving into buyer personas is just the beginning, Pollitt says; you must also understand where those target audiences hang out online, and research ways to infiltrate those publications and networks. Only then can you establish relationships with journalists and influencers who have the power to give your content free coverage or to enter into paid opportunities with perfectly matched publishing partners. The function of paid content is to reach audiences at scale. For top-funnel content marketing, Pollitt says native email and sponsored content perform the best (and keep your eye on social native opportunities on the horizon). To optimize your spend, research partners that can amplify your content and fit your budget. Not spending adequate time exploring paid and earned media options is a huge missed opportunity, says Pollitt. By doing the right research ahead of time, though, the paid/earned double-punch is more likely to drive your most important KPIs. Identify the most popular outlets and influencers in your industry. In an e-book project Pollitt’s company, Relevance, did with Teradata, the group garnered more than 40 media placements. The most surprising source of high conversions came from a niche site called KDnuggets. “Without research, we would have never uncovered that such a website even existed,” he says. Pollitt says tools like Cision, BuzzSumo, and Meltwater can help in this research. Show an interest in their work. Before cold-calling an influencer or editor you want to work with, see what has performed well for them socially. That way when you reach out, you can compliment their coverage and offer a new angle or take on their hottest topic, says Pollitt. Curate a piece of influencer-inspired content. When Relevance was working on a campaign targeting the woodworking industry, they started by compiling a list of the top 40 influencers in the space, from Bob Villa to less-famous bloggers. “We reached out for their No. 1 woodworking tip and created an infographic with all 40 tips. Once we were finished, we emailed them all the finished product,” says Pollitt. Each influencer then promoted the graphic to their followers. Success! Make social sharing easy. Whether it’s pre-writing tweets or Facebook posts, or creating embeddable graphics, the more shareable you make your content, the more likely influencers will take the time to disseminate your work. To distribute your content effectively, invest in research. Don’t stop at identifying the best media outlets and influencers to reach your target audience. Learn what those media outlets and influencers are doing and connect with them strategically. Doing so will ensure that your best creations won’t fall on deaf ears.